I hope you had a chance to try my Iced Turmeric Ginger Latte. I sipped on it all summer long, even when we were in Austria visiting my father-in-law, Axel. Luckily, I managed to find a health food store in in small town Klagenfurt that sold fresh turmeric. 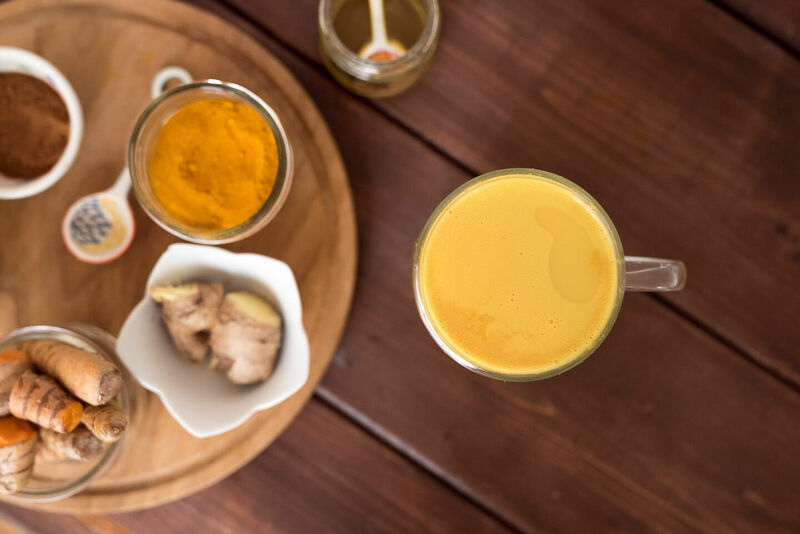 Now that it's getting chilly out, I'm sipping on this turmeric ginger tea. It warms you from the inside out and nourishes your whole being. Plus it's the colour of the trees right now in High Park. 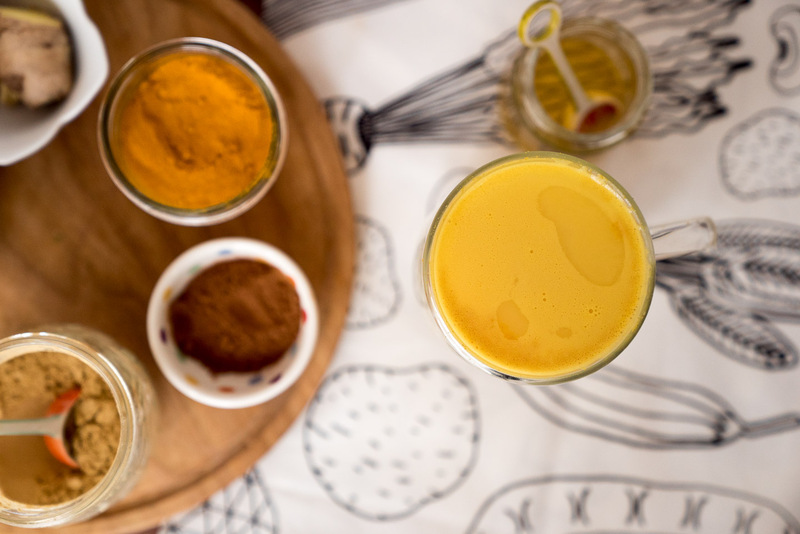 Turmeric and ginger are super healing anti-inflammatory foods. You may have heard that the Okinawan people of Japan have the highest population of centenarians (people who live to one hundred years old or more). Researchers attribute this long lifespan to their diet and their lifestyle – it is truly a holistic approach. Interestingly, a very popular drink in Okinawa is turmeric tea! In fact, most stores sell powdered, ready-made turmeric tea. I think they are on to something with their love of turmeric. Even though it's very easy to find powdered ginger and turmeric, I prefer using fresh when I can find it. This warming drink tastes absolutely wonderful, spicy and sweet. Turmeric has more known health benefits than another other botanical in modern science. Before we get to the recipe, I’ve gotta share some of them with you! Detoxifying: Stimulates phase 2 liver detox pathways. Thins the bile: That may sound like a weird health benefit but "thinning of the bile" allows it to flow more freely through the intestines. This translates to better detoxification. Bile is a carrier of toxic waste products. Antidepressant: Recent studies have shown that turmeric can be used to effectively treat some depressive disorders. Blood-sugar balancing: Turmeric can help lower blood sugar levels and fight insulin resistance. The key to getting all these health benefits is to use high-quality spices, preferably certified organic or use fresh turmeric and ginger root. 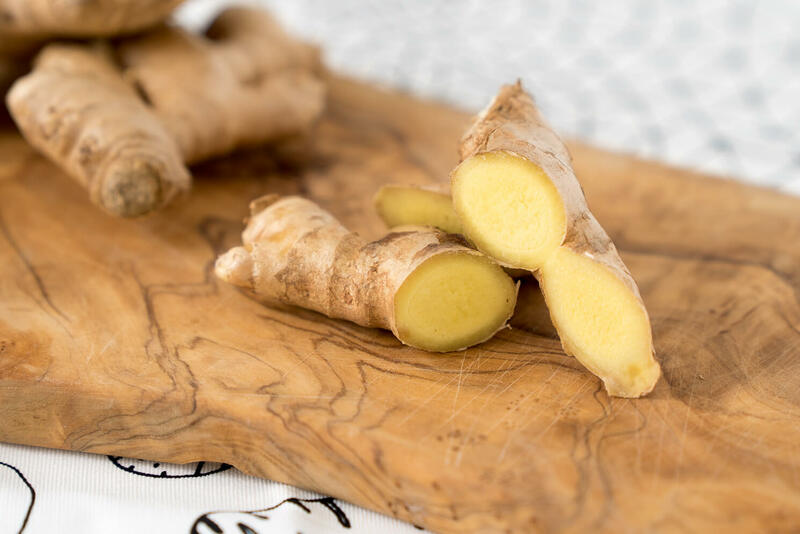 Here is this wonderfully healing and deliciously detoxifying recipe for Turmeric Ginger Tea and a recipe video, it is so good, we had to post it on my YouTube channel. Add honey, coconut oil or coconut butter to your desired amount. Add coconut milk if using. There you have it! My turmeric ginger tea. I hope you love it and it becomes a favourite recipe in your home for years to come! 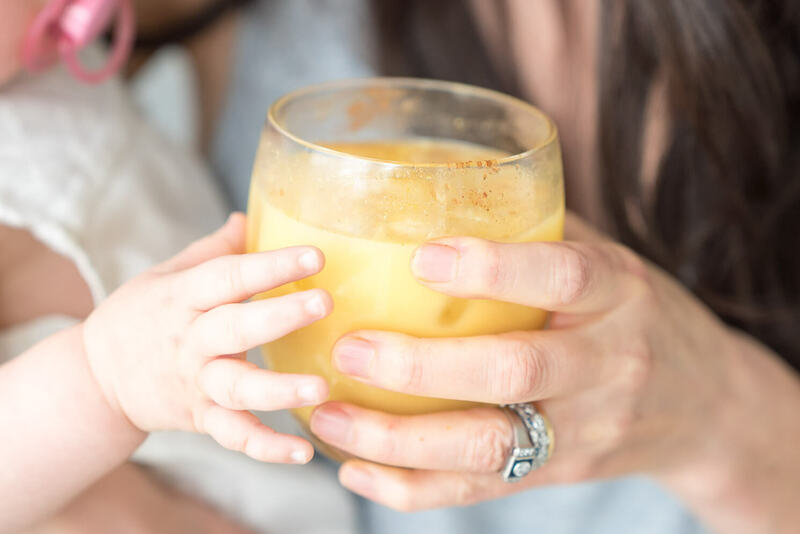 And if you're reading this post from somewhere warm and you'd rather have it chilled, be sure to check out my Iced Turmeric Ginger Latte. As you can see from the little hand, Vienna loves it too. Before I go, I wanted to add an update to this post which I talk about in this video at 6:05 and it's s a question I get asked all the time: "Joy, why don't you add black pepper?". I do not add black pepper because it's not necessary for the bioavailability of curcumin when you are consuming turmeric in its whole food form due to the presence of other phytonutrients like turmerones. 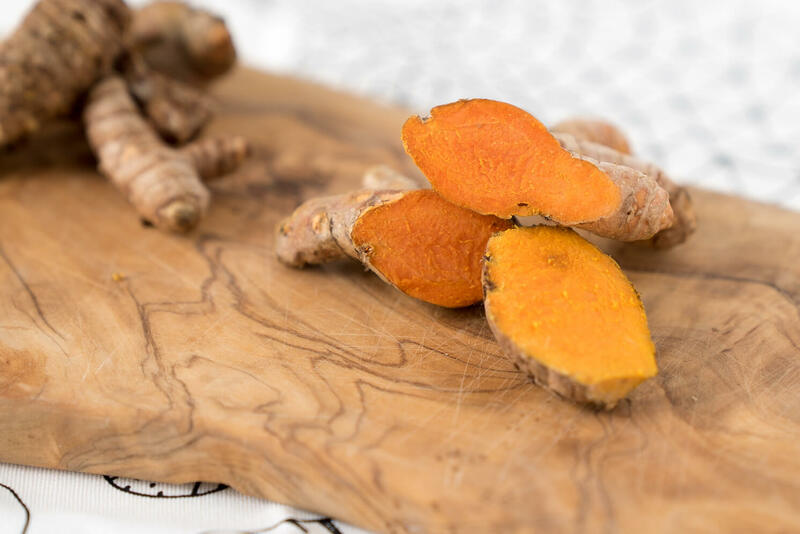 If you're taking a supplement of curcumin on its own then you do need something to enhance the absorption because it's now an isolated phytonutrient and you've lost the nutrient synergy of being in its whole food form. I talk about it more in that post I linked. I hope that makes sense! I didn't have any ginger on hand so I substituted it with Cardamom. It was delicious! I was expecting this tea to be bitter, but it wasn't at all. What are the health benefits of Cardamom? Great recipe - make sure to only add the honey once the drink has slightly cooled down as honey should not be heated. My functional medicine doctor gave me the same recipe and made sure to mention that about the honey, it should never be heated, it looses nutrients. Thank you. I’m wondering if you should limit this to one per day. When I first saw this recipe I thought I read something about that. Hi Joy: So from reading the comments it seems if I am using powdered turmeric I should add some black pepper, but if I use fresh I don't have to? Also, what kind of blender doesn't explode when blending boiling water? Your first instructions sound scary to me, but the final results look delicious! I made this tea last night and it was AMAZING!! Stopped my craving for a sweet after dinner. Thank you. Hello joy, Love your recipes and blog! 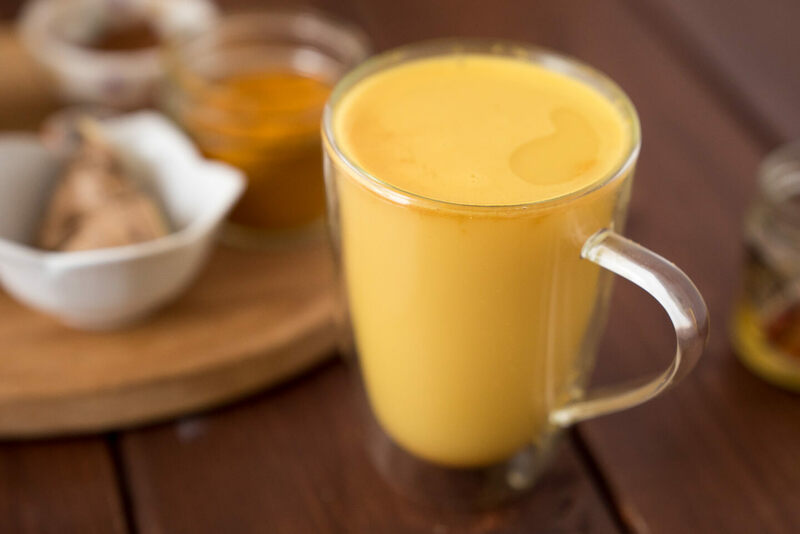 My naturopath just told me to look up Golden milk and drink daily for digestion issues, love the look of this one! If I was to instead use fresh, do you peel off the skin or grate it all? Also is it necessary to grate it, or just add small pieces to vitamix? If I was to double this recipe would it overflow the vitamix, maybe I should make everyone a separate drink? thanks for all you do for all of us! I just mixed up the tumeric ginger tea, it is fabulous! Is the coconut oil necessary? I recently read that coconut oil has a high saturated fat content that raises the body's LDL cholesterol. Is its purpose in the tea to help dissolve the cinnamon and tumeric? Mmmm....delicious!! Just tried it and I love it! Thank you for bringing another wonderful thing to my life ?? So good....so relaxing! It feels like a walk in the park. It has this calming affect on me. Thank you! I just made this. It is so delicious and I cannot believe how EASY it was. Thank you for sharing. This will be a regular drink for me. Hi! Where do you get your organic ground tumeric if I could ask. I'm looking for a high-quality tumeric to help fight cdiff. Thanks! Is this ok to drink while breastfeeding? I know some detox methods should be avoided. I'm allergic to coconut, is there an alternative that I can use in its place? Hi Joy! I'm wondering if I don't have a vitamix, if I could still use a blender for this recipe, say, a ninja bullet? Or would I just be better off adding these ingredients into boiling water on the stove? Thank you! Hi Joy, Do you have a video on the recipe with fresh ingredients and using a nut milk? Do you heat the nut milk? Hi, I made this tea tonight using fresh ingredients but I don't have a blender to use so I just steeped it all in my teapot. It tasted lovely but I'm wondering if I'll get the same health benefits from steeping? I used my rasp grater this morning and grated the fresh ginger and turmeric so I could consume more of it! One more question...some reciepes called for simmering the turmeric for 10-20 minutes, do I need to do that or is steeping for 5min enough? My tea turns out a dark color It's never been like the beautiful golden yellow. Hi there. The tea is delicious. It did, however, leave a stain in my blender jar. Any hints or tips to remove it? Thanks! How does the tea come out of your blender all creamy looking, as if you already put the coconut milk? Mine comes out a muddy mess. I tried this this morning with fresh tumeric and ginger..then another batch with powdered. Fresh is definitely better. I made this this morning, it’s delicious for this chilly morning! Any tips on how to get the turmeric stain out of the vitamix? Put half a lemon in it with hot water and blend. I also put it in my dishwasher from time to time (the vitamix that is) and it really cleans it. In the summer, leave it in the sun, it will burn off the staining. Hope that helps! Hi Joy, I have heard that you need to use a bit of pepper whenever using turmeric in order to activate the curcumin. Can you advise. Thanks! If usingfresh turmeric and ginger root do you peel it first? This was an amazing tea. I have tried several different tumeric teas and this is simply the best. I am hooked. Yay! Glad you love it Keeley! Hi Joy This is swarna from India. Well I have a query for you. I have been having a variation of this tea for several weeks to aid werght and detox the liver. Just wondering if o ne has to give a break in between. It's always good to take a break now and again. So yes, if you've been drinking it daily for several weeks I would recommend taking a break for a few weeks and then starting up again. Glad you're enjoying it Swarna -- such a pretty name! Can we add lemon to this tea? You can definitely sub ghee instead of the coconut butter. Enjoy! This tea is a must try for my arthritis. Unfortunately, it calls for coconut but I’m allergic. Can I just leave it out or replace it with something else? I love following you. You can definitely remove it. The coconut does make it creamy so as long as you swap it for something else, you'll still have a nice creamy texture. I use ginger turmeric root in my chai. I grate both the roots in hot water and boil/steep them until the kitchen has the aroma. Then, add tea leaves (black tea) and raw honey. I will try this recipe tomorrow am. No, you don't. 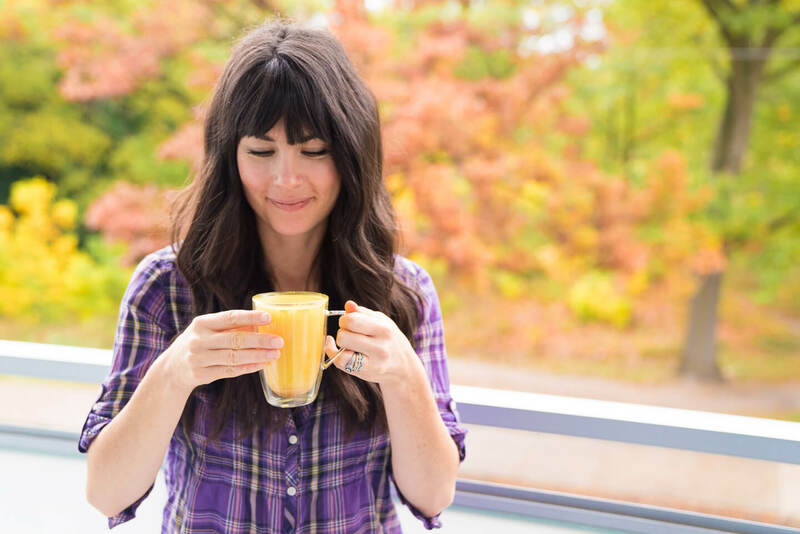 If you want more information, you can watch this video: https://www.joyoushealth.com/27186-blog-lazy-lady-turmeric-latte and at 6:05 I talk about why. Hope that helps!